You have already learned about the yoga concept of life force or energy otherwise known as prana. We all have seven energy centers which are known as ”chakras”. The work chakra means wheel and it may help you to visualize each center as a vortex spinning with energy. The chakras start at the base of the spine, finishing at the top of the head. Each chakra corresponds to a different point on the body. 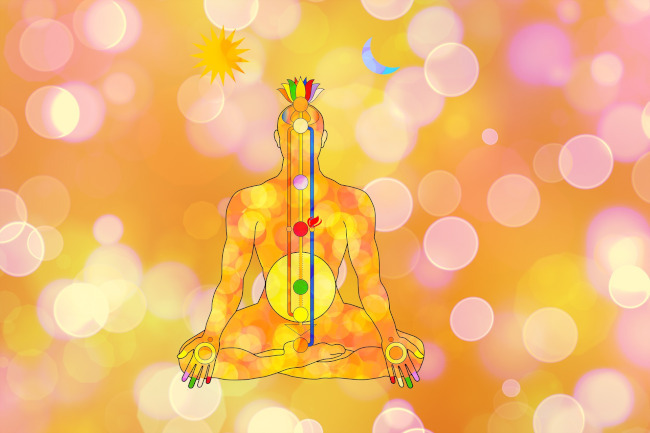 The traditional chakra system was designed to help yogis remember the form of the universe. Although it is hard for us to truly understand the yoga concept of prana, particularly because it is invisible, we can appreciate that when our energy is balanced we operate at our best. As the chakras are centers of energy, it follows that when they are imbalanced we may feel unwell or simply a little ‘off’. The first or root chakra is symbolized by the color red and is located at the base of the spine. This chakra relates to our most basic need to survive. The second chakra is symbolized by the color orange and is located beneath the navel. This chakra relates to creativity, sexuality, self- esteem and self-acceptance. The third chakra is symbolized by the color yellow and is located at the solar plexus. This chakra relates to power, growth and control. The fourth chakra is symbolized by the color green and is located at the heart. This chakra relates to the way we feel and express love and compassion. The fifth chakra is symbolized by the color blue and is located at the throat. This chakra relates to communication, truth and understanding. The sixth chakra is symbolized by the color indigo and is located at the third eye, slightly above and between the eyebrows. This chakra relates to intuition and wisdom. The seventh chakra is symbolized by the color violet and is located at the crown of the head. This chakra relates to our connection to the universe and self-realization. When we are practicing proper breathing we move prana through the body, which allows energy to flow freely. By awakening the chakras through yoga, you can draw in the Earth’s energy as you breathe.  Stand with your feet a few inches apart and hold your right arm out to the side with your fist clenched so that your muscles tense.  Your partner now stands behind you, pressing down on one or more of the muscles in your extended arm so that they can check strength and tone.  Keeping your right arm extended and your fist clenched, press your left hand into your abdomen just above the navel, curling in your fingers to do so. Your partner should now press down again on your right arm and will be able to feel that it is considerably weaker.  Now let both arms drop to your sides and breathe in and out deeply at least 10 times. Try to keep your chest and abdomen as still as possible while imagining that you are inflating your lungs to their fullest as if they were balloons. For a reminder of how to do this, turn back to the section on breathing.  Once you have completed your breathing exercise, extend your right arm again, clenching your fist to tense the muscles. Ask your partner to press down on the arm again and they should find that it is a lot stronger.  Repeat steps one and two but, this time, press the fingers of your left hand into the base of your breastbone or sternum. You should find that, this time, your right arm remains strong. Kundalini is the vast reserve of energy that lies dormant at the base of the spine until it has awakened by something such as yoga. Kundalini is translated as ”serpent power” and is symbolized by a snake. While the practice of yoga asanas and breathing frees up the body’s energy in a controlled way, attempting to release kundalini energy should be approached with caution.